Methylated N-methylol melamine (NMM) is known for its ability to enhance physico-mechanical properties, anti-fungal ability, and hydrophobicity and was therefore used to impregnate two less used and non-durable wood species from Myanmar, Bombax ceiba and Bombax insigne. Solution uptake, weight percent gain and nitrogen content were increased by increasing melamine concentrations with B. ceiba always achieving higher values compared with B. insigne. According to the leaching results, a higher degree of condensation after curing as well as a better crosslinking of NMM could be obtained at higher temperatures. However, both curing temperatures used (90 and 120 °C) resulted in almost the same amount of nitrogen fixed in the cell wall. UV microspectrophotometry confirmed the penetration of the NMM into different morphological regions of wood tissues, which was again supported by the analysis of point measurement spectra of treated and untreated specimens. Chemical modification with substances or resins containing melamine (‘melamine treatment’) has shown considerable potential to improve wood properties. Various formulations such as hexa (methoxymethyl) melamine, melamine–urea–formaldehyde (MUF) resin, melamine–formaldehyde (MF) resin, methylated melamine methylols, or melamine–ammeline–formaldehyde resins have been used to impregnate solid wood with satisfying results in most of the cases. The improvements of melamine-treated wood were reduced water uptake and increased dimensional stability (Pittman et al. 1994; Miroy et al. 1995; Gsöls et al. 2003; Krause et al. 2004), increased hardness and strength (Miroy et al. 1995; Gindl et al. 2004), increased decay resistance (Lukowsky 1999; Gsöls et al. 2003; Krause et al. 2004), lower inflammability (Pittman et al. 1994) and increased resistance to weathering and colour changes (Pittman et al. 1994; Rapp and Peek 1999; Hansmann et al. 2006). Besides the various physical and mechanical improvements, melamine-treated wood maintained the natural appearance of solid wood (Hansmann et al. 2006). Negative effects were rarely reported and referred to reduced impact bending and toughness due to the rigidity and brittleness of the cured resin inside wood (Pittman et al. 1994; Epmeier et al. 2004). Another type of resin that has been employed to impregnate solid wood for enhancement of properties is based on 1,3-dimethylol-4,5-dihydroxyethyleneurea (DMDHEU). DMDHEU-based resins, similar to melamine resins, are cold water soluble and cure at low temperatures of 90–100 °C; but they require a catalyst like weak acids to crosslink with wood constituents (Nicholas and Williams 1987). Treatment with DMDHEU or modified DMDHEU resins resulted in improved dimensional stability, reduced hygroscopicity and enhanced durability against fungi and insects (Videlov 1989; Militz 1993; Schaffert et al. 2006; Dieste et al. 2009; Mai et al. 2009; Militz et al. 2010; Peffer et al. 2010). However, in contrast to melamine resins, DMDHEU resins were reported to reduce strength properties depending on catalysts and processes used (Nicholas and Williams 1987). The improvement of properties through impregnation with resins containing melamine is attributed to the penetration of these resins into the cell wall causing a high degree of dimensional stabilisation (Stamm 1964). It is assumed that this improvement is provided by the formation of a three-dimensional network with corresponding increase in molar mass within the cell wall rather than a covalent bonding to the wood matrix (Lukowsky 1999). UV-microscopy revealed that only less than 2 % of the cell lumen was filled with the melamine–formaldehyde resin with a higher amount having penetrated into the cell wall. Specifically, concentration in the cell walls of treated samples amounted to 12.5 % (Gindl et al. 2003). The concentration of melamine–urea–formaldehyde resin deposited in the cell wall was estimated by UV-microscopy to be about 6 % (Gindl et al. 2002). Rapp et al. (1999) applied electron energy loss spectroscopy for the quantification of a monomeric methylated hydroxymethyl melamine compound in the cell wall and found it to be about 20 % in the S2 and 30 % in the S3 layer. The relative amount of melamine deposited in the middle lamella was found to be higher than that in the S2 layer. Melamine resin could penetrate into the cell wall even after acetylation and silylation treatment; the melamine treatment did not lead to substantial washing out of silyl groups (Hansmann et al. 2005). This work reports on the impregnation with an aqueous solution of a methylated N-methylol melamine (NMM) compound of two less used and non-durable hardwoods of Myanmar origin, B. ceiba and B. insigne. Selected factors influencing the NMM load, such as the concentration of the solution used during the impregnation step and the curing temperature, were studied. 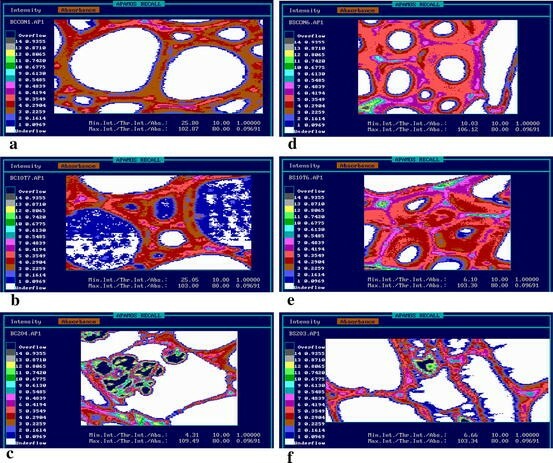 UV microspectrophotometry (UMSP) was applied to investigate the subcellular distribution of the NMM in different morphological regions of wood tissues. Four logs, two for B. ceiba and two for B. insigne, were obtained from the Myanmar Timber Enterprise, Ministry of Forestry, from the deciduous forests of Pyinmana District, Myanmar. The logs, approximately 5 m long and with 70 cm medium diameter, were flat sawn into 5-cm-thick boards and air-dried to around 12 % moisture content. For each of the two species, B. ceiba and B. insigne, samples of various sizes (20 × 20 × 10; 25 × 25 × 10; 30 × 5 × 30; 30 × 30 × 30; and 10 × 10 × 180 mm3, radial × tangential × longitudinal) were prepared from the heartwood parts of the boards. All samples were finally oven-dried at 103 ± 2 °C for 48 h to reach a constant oven-dry weight (W1). Prior to the melamine treatment, the oven-dried wood samples were conditioned at 20 °C and 65 % RH for a constant weight (W2) and their dimensions were measured. The methylated N-methylol-melamine (NMM) compound was Madurit MW 840/75 WA (Ineos Melamines, Frankfurt/Main, Germany). It was supplied as an aqueous stock solution with a solid content of approximately 75 % (determined by evaporation of water at 120 °C for 1 h). The dynamic viscosity of the formulation was 350–750 mPa s, the specific gravity 1.245–1.260 g ml−1 (both at 23 °C) and the pH value at 20 °C 10.0–11.0. To analyse the effect of the solid content (ML) on the treatability of samples, solutions with different content of NMM were prepared. Thus, the delivered stock of NMM was diluted with tap water of pH around 7 in mass ratios 66:934 (ML = 5 %), 132:868 (ML = 10 %), 264:736 (ML = 20 %) and 528:472 (ML = 40 %). After adding water to the NMM stock solution, the mixture was well stirred in an electric shaker until no suspension was observed, and the pH value of the solution was recorded (8.06 ± 0.06). Then, 1 % of ethanolamine was added in order to raise the pH of the solution to 8.9 ± 0.1. Finally, sodium hydroxide was added until the solution attained a pH of around 10. The conditioned wood samples were impregnated in a stainless steel vessel using a process including an initial vacuum phase of 0.005 MPa for 45 min and a pressure phase of 1.2 MPa for 2 h. After impregnation, the excess solution was removed from the surface of the samples with paper tissue and the samples were weighed (W3). Half of the samples (per species and size) were cured at 90 °C and the others were cured at 120 °C for 72 h in an oven. After curing, the samples were cooled down in desiccators above silica gel and weighed (W4). Hence, contrary to W3, W4 does not include anymore water from the impregnation process. where SU = solution uptake, kg/m3; W3 = weight of sample after impregnation, kg; W2 = weight of conditioned sample before impregnation, kg; VAD = volume of conditioned sample before impregnation, m3. where RSU = relative solution uptake, %; W1 = oven-dry weight of sample before impregnation, kg. where WPG = weight percent gain, %; W4 = weight of sample after curing, kg. The overall mean of SU and WPG were obtained by averaging the mean values of different sample sizes and are shown in Fig. 1. Only samples of three sizes (20 × 20 × 10; 25 × 25 × 10; 30 × 5 × 30 mm3) were used for a leaching test, which was conducted by soaking the samples in demineralised water for 2 weeks according to EN 84 (2002). Specifically, twenty samples per species and size were used for each set of ML and curing temperature. The weight loss of each sample was calculated as a percentage of its weight after curing. Untreated samples were included as controls. The samples of size 30 × 30 × 30 mm3 treated with solutions of different concentrations ML (5, 10, 20 and 40 %) were used to analyse their nitrogen content. Untreated conditioned samples (20 °C and 65 % RH) served as controls. Thin shavings from ten samples per ML and curing temperature were fed to a Retsch mill with a rotating knife to produce particles passing a 3-mm screen. Each sample of the particles was divided into two portions, one to be washed out and the other one to remain without treatment. This procedure was carried out in order to distinguish between the total melamine content of the particles after impregnation and the remaining melamine content after the washing process. Though this washing procedure rather affects the melamine compound in the lumen than in the cell wall of the wood tissue, the loss in nitrogen content still cannot clearly be assigned only to the loss of melamine containing material in the lumen. 1–1.5 g of the particles were placed in flasks with 30 ml of demineralised water and kept in a water-bath at 95 °C for 16 h. After filtration, the particles remaining in the filter were oven-dried at 103 ± 2 °C until a constant weight was attained. where NF = amount of nitrogen fixed in the cell wall, %; NCWS = nitrogen content of the washed sample, %; NCUWS = nitrogen content of the unwashed sample, %. The distribution and impregnation of NMM within individual cell types (fibres, vessels and parenchyma cells) and cell wall layers (S2) were investigated using scanning UV microspectrophotometry (UMSP) according to Koch and Kleist (2001) and Koch and Grünwald (2004). From both, the impregnated and the control samples with sizes of 10 × 10 × 180 mm3, small blocks of 1 × 1 × 5 mm3 were separated and directly embedded in Spurr’s epoxy resin (Spurr 1969) under mild vacuum with several cycles of evacuation and ventilation as described by Kleist and Schmitt (1999). From these embedded blocks, transverse thin sections of 1 μm in thickness were prepared with a diamond knife and transferred onto a non-reflective quartz slide; a drop of non-UV-absorbing glycerine was added, and the sample was covered again with a non-reflective quartz slide. The topochemical analyses were carried out using a Zeiss UMSP 80 microspectrophotometer equipped with a scanning stage, which enables the determination of image profiles at defined wavelengths with the scan software APAMOS® (Zeiss). The scan programme digitises rectangular fields on the thin sections with a local geometrical resolution of 0.25 × 0.25 μm and a photometrical scale resolution of 4,096 greyscale levels, which are converted to 14 basic colours to visualise the UV absorbance intensities. Photometric point measurements were also conducted on spot sizes of 1 μm2 at wave lengths between 240 and 560 nm using the scanning software LAMWIN® (Zeiss); the wavelengths of 241–244 nm are characteristic for melamine and melamine compounds. Ten to fifteen spectra were obtained for each individual S2 layer of fibres, for the cell wall surface towards the cell lumen, and the middle lamella, respectively. The results on solution uptake (SU) and weight percent gain (WPG) are shown in Fig. 1 as overall means of all sample sizes and demonstrate that B. ceiba and B. insigne were easily treated with the NMM compound. For both curing temperatures, increase in solid content of the solution (ML) resulted in increased SU and WPG for the two species. That implied an increased infiltration of NMM into the lumens and in case to the cell walls. SU (kg/m3) as well as RSU (% based on the oven-dry weight), however, increase only slightly with increasing ML, whereas the increase in WPG is much more pronounced. This means that penetration into wood material is rather independent of the concentration of the solution; water and melamine resin behave only slightly different in their penetration behaviour as long as the NMM molecules are small enough; but after curing, the much higher amount of resin penetrated with the higher ML remains in the wood material, whereas only water evaporates. For the same ML, the curing temperature had no major effect on the mean WPG in both species. That was noticed for all sample sizes tested as differences in WPG were small. For both curing temperatures and for each ML, mean SU and WPG were greater for B. ceiba than for B. insigne (Fig. 1). Since the two species are rather similar in their wood anatomy, the differences could be attributed to the lower wood density of B. ceiba compared with that of B. insigne, as among other factors, the possibility of treating various wood species can be attributed to their content of large vessels with numerous slit-like intervessel pits and the profound quantity of large axial parenchyma (Pearson and Brown 1932). The mean oven-dry density of the total 140 samples was 0.26 (± 0.01) g/cm3 and 0.37 (± 0.01) g/cm3 for B. ceiba and B. insigne, respectively. In both species and for each ML, weight loss due to leaching was much lower for samples cured at 120 °C than for samples cured at 90 °C (Fig. 2). At the curing temperature of 120 °C, the maximum weight losses of treated samples could be kept as low as 4.4 % (B. ceiba) and 2.9 % (B. insigne), values close to those of the controls (4.5 % in B. ceiba and 2.4 % in B. insigne). Samples cured at 90 °C showed progressively increasing leaching with increasing ML in both species; 9.3–15.8 % in B. ceiba and 6.8–16.2 % in B. insigne (Fig. 2). This phenomenon accounted for a higher degree of curing of NMM by condensation reaction of the compound and in case also enhanced reaction with the wood cell wall constituents at 120 °C compared to 90 °C. This finding was in agreement with an earlier report also mentioning a higher degree of crosslinking of a melamine–formaldehyde resin at 140 °C compared with 85 °C (Devallencourt et al. 2000). It is obvious that both, a reaction of NMM with the cell wall compounds and a higher degree of condensation after curing, can decrease leaching. Melamine resins need curing temperatures higher than 90 °C to achieve a complete crosslinking. In the activation of MF and MUF to give a sufficient degree of polycondensation (degree of curing) in the final products, lowering pH and higher temperatures are involved (Frihart 2005). Interestingly, at the better performing curing temperature of 120 °C, weight loss of samples was even lower with higher ML. The differences were confirmed statistically by ANOVA at P < 0.05 (F = 55.090 for B. ceiba and F = 86.692 for B. insigne). At that curing temperature, the range of WPG was 16–133 % and 9–79 % for B. ceiba and B. insigne, respectively (see Fig. 1); this means that for the different ML in use totally different material is created after impregnation. The lower weight losses at higher ML can also be the consequence that curing is performed better when more curable resin is available or simply that the lower amounts of cured resin show more ‘surface’ accessible for water instead of rather bulk and dense material at high WPG. Additionally, access of water can be hindered by the high WPG. It has to be noted that the differences between the two curing temperatures (for a certain ML) are much higher than the differences in weight loss at the same temperature at different ML. Increase in weight loss with ML is evident for the lower curing temperature implying that curing at the temperature of 90 °C is still incomplete. In contrary, at 120 °C, curing seems to be quite complete. As the crosslinking temperatures of methylated melamine resins depend among others on wood content (Holmberg 1984), it was expected that a higher curing temperature would be required with higher ML to achieve the same degree of crosslinking (Frihart 2005). Furthermore, other factors than incomplete curing of the resin at 90 °C might also play a role. For example, drying of the treated material might need much longer time and the presence of moisture for such longer period might result in hydrolysis of the resin, which can be leached out more easily. For both curing temperatures and for each ML, B. insigne showed lower weight loss due to leaching than B. ceiba, obviously due to its inferior treatability and also due to the less accessibility of water to the bulk wood material (lower SU and WPG). The nitrogen content and its mechanical fixation in the cell wall of NMM treated (washed and unwashed) and control samples of B. ceiba and B. insigne are presented in Table 1. Control samples of both species showed a similar low amount of nitrogen (0.17 % in B. ceiba and 0.18 % in B. insigne), which is comparable with the average 0.20 % of the dominant Amazon trees (Martius 1992). Impregnation of both species with different ML caused a considerable increase in nitrogen content that varied from 6 to 28 % in B. ceiba and from 4 to 20 % in B. insigne. For the ML 5 % solution, a bigger part of the NMM obviously remains in the lumen rather than penetration into the cell wall in combination with the hot water elution of the small total amounts of NMM mainly from cell lumen; this is shown as lower nitrogen content in the washed samples and lower fixation (42–44 % for B. insigne and 72–79 % for B. ceiba). With the exception of B. insigne at ML 10 % and curing temperature of 90 °C, for all other ML the amount of nitrogen fixed in the cell wall was over 88 %. B. ceiba samples achieved a higher amount of nitrogen due to their higher SU and WPG. As shown in Table 1, the increase in ML had a positive effect on nitrogen content in both species due to greater fixation. Surprisingly, the curing temperature seems to have no significant effect on the nitrogen content after washing. This might be attributed to the possibility of further curing during the washing procedure, though also some hydrolysis might occur at the same time. As shown in Fig. 3, the deposition of NMM was topochemically detectable in various morphological regions of wood tissues of the treated specimens by the UMSP. The S2 layers of the untreated cell walls (axial parenchyma cells and fibres) were characterised by UV absorbance values in the range of 0.16–0.23 AU in B. ceiba (Fig. 3a) and 0.23–0.35 AU in B. insigne (Fig. 3d) representing the normal lignification (absorbance maximum at 278 nm of hardwood lignin, for example, see Fergus and Goring 1970) of both species. In comparison, the woody tissue of B. insigne revealed a higher lignification as evidenced by significant higher absorbance values of the individual cell wall layers (compare Fig. 3a, d). After treatment, the S2 layers of both species showed unchanged absorbance behaviour (similar absorbance values) at the selected wavelength of 278 nm (representing the absorbance maximum of hardwood lignin, compare Fig. 3a with b and Fig. 3d with e). Due to the fact that the (pure) melamine resin is characterised by an absorbance maximum in the wavelength range of 241–244 nm (Gindl et al. 2002), the impregnation and crosslinking of NMM were not detectable using the wavelength of 278 nm (detection of lignin). However, the scanning image profiles of the treated samples revealed low detectable absorbance intensities (range of 0.09–0.16 AU) in the cell lumen of parenchyma cells and fibres that were derived (or deduced) by the deposition of NMM. In detail, the treated samples of B. ceiba showed higher NMM depositions in the cell lumen as compared to B. insigne, because of higher SU (compare Fig. 3b, e). The scanning profiles in Fig. 3c, f show tissues of axial parenchyma with (distinct) cell-lumen deposited extractives, presumably tannins (polyflavonoids) that were naturally synthesised during heartwood formation in the living tree. The presence of the tannins can be easily visualised by spherical conglomerations of high absorbance values (abs280nm 0.68–1.00) compared with the surrounding cell wall tissue (Koch et al. 2006). The impregnation of NMM into the different morphological regions of B. ceiba and B. insigne wood tissue was (basically) confirmed by the analyses of point measurement absorbance spectra, which are shown in Figs. 4, 5 and 6. An assignment of the different wavelengths to wood species, location in the wood tissue and detected material is presented in Table 2. The spectra of cured NMM deposited in lumen of vessels, fibres, and axial parenchyma and ray cells without naturally deposited extractives (tannins) of both species revealed distinct absorbance maxima in the range of 246–248 nm wavelengths, after which the UV absorbance intensities declined sharply (Fig. 4a, b). Spectra of the middle lamella of treated fibre tissues showed two typical absorbance maxima at 242 nm (from impregnation with the NMM) and 278 nm (absorbance of lignin) for B. ceiba and B. insigne, respectively (Fig. 4a, b). Similarly, the S2 layers of NMM-embedded fibre, axial parenchyma and vessel tissues of both species were characterised by two absorbance maxima in the range of 241–244 nm and at 278 nm wavelengths (Fig. 5a–d). The absorbance maximum at 278 nm is due to lignin (e.g. Fergus and Goring 1970; Koch and Kleist 2001), while the other detectable absorbance maxima at 241–244 nm could be related to melamine containing compounds (Gindl et al. 2002). 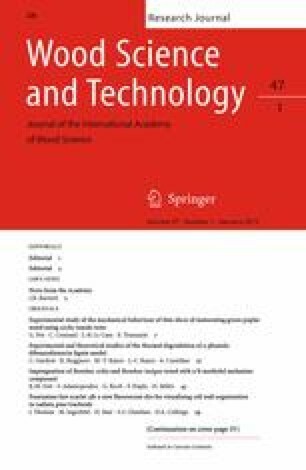 The spectra of extractives (tannins) naturally deposited in vessel and parenchyma tissue of untreated B. insigne were mostly characterised by one pronounced absorbance maximum in the range of 280 nm with a bathochromic shift to a wavelength of 284 nm and a slight shoulder to a wavelength range of 300 nm (Fig. 6b). This spectral behaviour can be explained by the presence of chromophoric groups, for example, conjugated double bonds. The higher degree of conjugation stabilises π-π* transitions resulting in absorbance bands shifted to higher wavelengths (Goldschmid 1971) that can be detected by UV microspectrophotometry (Koch et al. 2006). Against this, the spectra of extractives in the tissue of NMM-treated B. insigne were characterised by additional maxima in the range of 244–248 nm (Fig. 6b). A comparable UV characteristic was detectable for the extractives naturally deposited in the parenchyma of treated and untreated tissue of B. ceiba (Fig. 6a). The distinct absorbance maxima in the wavelength range at 244–248 nm must be attributed to the presence of NMM. The typical spectral behaviour of the pure melamine can also be detected topochemically in the cell lumen of vessel and parenchyma cells, which do not contain natural deposits (see Fig. 4). The characteristic spectral peak of the fibre S2 layer attributable to NMM was only detected at 241 nm wavelength in B. insigne, although those were characterised by different wavelengths from 241 nm to 244 nm in B. ceiba. While the peaks at 241–242 nm were related to a cured melamine–urea–formaldehyde resin, the liquid melamine–urea–formaldehyde drop was represented by the absorbance maximum at 244 nm (Gindl et al. 2002). This small difference was linked to the selective impregnation of lower molecular weight compounds into the cell walls. On the other hand, the melamine–formaldehyde resin cured in the cell walls of three softwoods displayed a selective absorbance maximum at 245 nm (Gindl et al. 2003; Deka et al. 2007). Thus, the alterable absorbance maxima at 241 nm to 244 observed in this study could be attributed to different molar mass compounds and chemical reactions of NMM. The slight differences in the absorbance maxima of NMM-treated fibre cell walls between the two species might be due to different wood anatomical structures (differences in density) and chemical composition (B. insigne contains higher concentration of phenolic extractives, Sint 2010) as well as individual process parameters, which facilitate penetration of different molar mass compounds of NMM into the cell walls. As B. ceiba forms relative thin fibre walls with wide simple pits, it would enable the uptake of higher molar mass compounds. Similarly, different absorbance maxima (at 246 nm in B. insigne and at 247–248 nm in B. ceiba) detected for the cured NMM in the lumen of various cells might probably arise from the occurrence of melamine compounds, e.g., dimers or trimers of melamine. Both investigated wood species exhibited high values of solution uptake (SU) and weight percent gain (WPG), which demonstrates their possibility to be treated successfully with a NMM compound of varying concentrations. Based on the leaching tests, the NMM compound requires curing temperatures higher than 90 °C and high concentrations to achieve a complete crosslinking within 72 h without any other catalysts and hardeners. The higher the concentration of the NMM solution, the higher are SU and WPG, respectively, and hence, the melamine content in the wood tissue. The ability for NMM compound to penetrate different morphological regions of wood tissues was photometrically followed by the UV microspectrophotometry; this fact was also confirmed by the analysis of the point measurement spectra of treated and untreated samples. The overall results are useful in exploring and explaining the optimal parameters when treating the two investigated wood species with NMM to improve their dimensional stability, hygroscopicity and mechanical properties.